If you're a recent college graduate or young adult looking to save a few bucks on rent by moving back home for a little while, you may want to think again, because there's a pretty good chance your parents are getting ready to convert your old room into a home office. So says a report released last week by consultant IDC, which said that the number of home-based U.S. businesses will increase by more than 10% over the next four years to about 21 million. Meanwhile, the number of telecommuters will rise by about 12% to about 9.5 million, according to IDC senior analyst Justin Jaffe. Whether the trend reflects more of a rising-tide effect of economic growth or increasing financial challenges for those approaching retirement is open to interpretation. Earlier this month, the Labor Department said the economy added 192,000 jobs in February, pushing the nation's unemployment rate down to 8.9%, slightly better than January's 9.0% rate and an improvement from February 2010's 9.7% rate. Last month's unemployment rate was the lowest since April 2009. More overall workers would mean more telecommuters, which would mark a reversal of the trend of recent years, when the number of those working from home fell from about 9 million in 2005 as more people embraced the perceived security of being within reach of the boss. "You want to make sure you're seen and heard at the office when times are tough," said Jaffe, adding that as the economy improves, "people get a little more comfortable with not being visible in the office." Still, the increase in the numbers of home-based workers reflects more than just the economy's good news. With Baby Boomers approaching retirement age in record numbers, many U.S. employees either have been pushed out of their jobs, and many lack the financial stability to retire comfortably in the wake of the recent recession, which ate away at workers' retirement savings, according to Robert Trumble, professor of management at Virginia Commonwealth University and director of the Virginia Labor Studies Center. That has induced a large number of people to take an entrepreneurial approach and opening home-based businesses. Indeed, about 22% of Americans expect to work past the age of 70, with 6% expecting to retire after their 80th birthday, or about two years past the average national lifespan, Nielsen said in a report published last month. All told, Americans were about 70% more likely to expect to work past 70 than their global counterparts. And with almost 20% of the U.S. population between 50 and 65, according to Census figures, that may mean a lot more home offices. "Baby Boomers are getting to the point where they're looking for part-time work, and they're not finding it, so they're exploring this," said Trumble. "Their retirement prospects won't be as good as what their parents had." 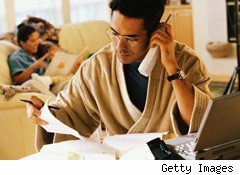 That increase in the numbers of home-based workers will both reflect and spur advancements in communications-based technology such as smartphones and tablet computers. Global tablet-computer unit sales will jump about tenfold over the next few years as computer makers like Hewlett-Packard (HPQ), Dell (DELL) and Research In Motion (RIMM) jump into a market currently dominated by Apple's (AAPL) iPad, according to reports released by IHS iSuppli and NPD Group's DisplaySearch unit last month. Meanwhile, almost 66 million Americans owned smartphones in January, up 8% from three months earlier, ComScore said in a report earlier this month. Trumble notes that expectations of consumers' increasing desire for smartphones and communications-based technology helped spur AT&T's (T) decision earlier this week to acquire T-Mobile USA for $39 billion. But none of those gadgets will help home-based workers if the economy turns south again. "There's a limit to how many days you want to work from home," said Trumble. "When times get tough, you have to increase your networking because you never know when you'll need a job."